We as writers, know how important it is to have a voice. We know how important it is to share how we feel, recount things that have happened in our lives, and to tell stories. The words we choose to share as writers are bits and pieces of our soul; even if it is just a simple word, it still counts. Sharing our voice stirs something inside us; excites us. We know, that language has a way to change people, inspire people, and evoke emotions. Without it, where would we be? Think about it: if you could not write, how would you feel? What if you are one of the many people in the world who feel their voices aren’t heard? What if your voice, your words, did not matter? It’s a scary thought, right? The truth is, there are those who don’t know how to speak up or share their voice. I'm talking about adults and youth who are incarcerated, or moving out of incarceration, and youth who may be at-risk for incarceration. Who is willing to listen to them and their stories? Would you? To create alternative literacy opportunities that work to educate and empower underserved populations. The Center supports university literacy research and outreach that promotes community action and social change. The Speakout! Program is one of the best examples of how this mission is being accomplished. Speakout works with seven groups, in which interns (like myself) and volunteers, teach and facilitate writing workshops. These groups are from the Larimer County Jail, Community Corrections, Remington House (youth), and Turning Point (youth). Each week, interns and volunteers come prepared with prompts and ideas to get the participants of the workshops writing. And, not only that, we encourage the participants to use their writing as a way to share their voices with a larger population. 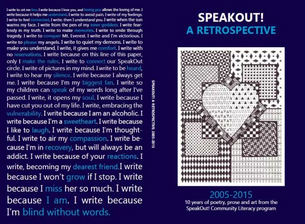 What I mean by this, is that each semester, the CLC and the Speakout volunteers and interns, put together a journal filled with poems, stories, musings, and art from the writers in each of these workshops. The journals are filled to the brim with voices that have been quiet or even ignored. At the end of the semester, the journals are published and given to each writer of the workshop who put their words and art into print. We celebrate with the participants and it is a great time to have them read their work and share it with friends and families. Not only that, the journals are spread throughout the community and others by way of hands and word-of-mouth. By doing this, the words of the people whose voices haven’t been heard, are spread all over. Their words and stories are shared and others have a chance to listen. Coming from someone who participated in one of these workshops (I worked with youth from Turning Point) the words of these kids have had a huge effect on me. They have moved me and inspired me in ways other words have never done before. Their words are their hearts in ink and their souls in print. The work in the journal has a power to it that says, "Listen to me, because I am here and I exist and I have something to say!" What an amazing program, Delaney! Great post Laney! So proud of you! Hi, Laney. Thanks for the great post, and for the volunteer work you've been doing to benefit the community. I completely agree that it's important for everyone to have a voice. Is there a way for others to volunteer with the Community Learning Center and their Speakout! program? Hi Laura--Yes--please contact us as clc@colostate.edu for information about how to volunteer and support our SpeakOut! program. Thanks for sharing this - both your thoughts about your experience and info on the program you interned with! 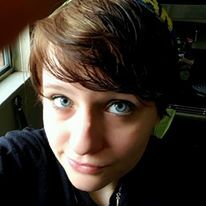 I'm in Ohio (I don't even remember how I got linked to this site, but based on this connection, it was meant to be!) and looking for ways to help a group of incarcerated writers. Lots of good ideas here! Just knowing others are doing something to unlock the words within is encouraging!